The Calgary Roughnecks secured their spot in the 2018 NLL post-season with a 13-9 victory over the Vancouver Stealth on Saturday night. A strong second-half push by the Roughnecks proved to be the difference in the game. Christian Del Bianco and the rest of the Calgary defence held Vancouver to just two second-half goals, while the Calgary offence scored seven times to seal the victory for the Roughnecks. It was just under a year ago that the Stealth ended Calgary’s run of 14 straight playoff apperances. This time it was Calgary’s turn to repay the favour. Despite playing for their playoff lives, Vancouver started the game sluggishly. Dane Dobbie got the visitors on the board 3:52 into the game. Calgary would carry the play in the first, firing 16 shots at Eric Penney including five shots that rang off the post. Vancouver would seize the opportunity and get two late goals from Logan Schuss and Pat Saunders to take a 2-1 lead. Calgary started the second quarter on a three-goal run. Goals by Riley Loewen, Curtis Dickson and Holden Cattoni put the Roughnecks momentarily ahead. The Stealth shooters finally began to find their range, and led by their stars, went on a four-goal run of their own. Corey Small, Rhys Duch and Schuss all scored from a distance, while Saunders finished a nice tic-tac-toe passing play in transition. The half would end with the teams exchanging goals, but with Vancouver still holding the lead at 7-6. The third quarter is when the tide turned in Calgary’s favour. Led by a stifling defence, Calgary continually forced Vancouver into bad offensive sets. Veteran defender Andrew Suitor tried to rally his team with a huge hit on Tyson Bell and then later, a hit on Del Bianco that sent him to the turf. Unfortunately, it wasn’t enough to generate the momentum Vancouver desperately needed. Calgary ended the quarter with five goals and an 11-9 lead. In a season plagued with inconsistent play, perhaps the fourth quarter summed up the Stealth’s season. An early Stealth power play and a chance to make it a one goal game turned into a breakaway for Mitch Wilde and a backbreaking shorthanded goal for the Roughnecks. On the play, Duch was caught by referee Todd Labranche for running through the crease and the play was whistled. Wilde immediately scooped the ball and ran the length of the floor scoring far side on Penny. Vancouver was unable to recover and was held scoreless in the fourth quarter. “Any time you lose, it is going to be disappointing. We battled hard and we are coming together as a team, but we came up short again,” said goaltender Eric Penney in a Stealth press release. “In the dressing room, everyone has each other’s backs. We are a tightknit family and although this is not the circumstances we want to be in we are still battling. Calgary (6-8) was led by Curtis Dickson who scored three times and added five helpers. Del Bianco shook off his last start and stopped 43 of 52 shots while adding two assists. Bell played exceptionally well, scooping nine loose balls and effortlessly moving the ball in transition all night. 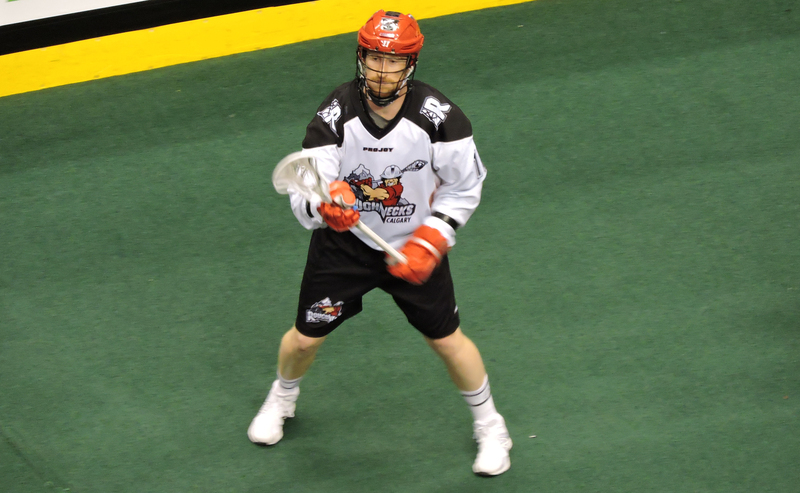 Calgary will be in New England next Sunday for a 2:00 p.m. EST game against the Black Wolves. Vancouver (2-13) received four-point performances from Corey Small and Pat Saunders, each with two goals and two assists. Eric Penney stopped 56 of a whopping 69 shots for a 0.812 save percentage and Ian Hawksbee led the Stealth defence with 12 loose balls. Vancouver will play out the rest of their season with games against Saskatchewan, Calgary and Georgia.